The SKS Narrow Road Mudgaurds, formerly the ESGE guards the SKS mudguards are undoubtedly the best quality full length guards available. The Chromo plastic offers simple but effective weather protection, perfect for going out on muddy roads for a ride. 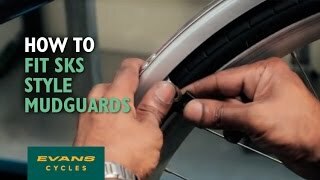 The front guard incorporates the Secu clip system, which avoids blocking of the wheel when an object gets between the tyre and the mudguard.